Debt. It’s something that has some sort of bearing on most people’s lives. In this day and age, it’s certainly not unusual to be in debt. For many, debt has very little impact on their lives as they are able to control and manage their debt and keep repayments at affordable levels. For others however, debt can cause stress, anxiety and unhappiness. It’s one of those things that if you don’t keep on top of it can spiral out of control. It is often said that debt is easy to get into but much harder to get out of. 2.) Don’t overstretch yourself financially – everybody likes nice things. Whilst there’s nothing wrong with luxury holidays and sports cars if you can afford them, loading your credit cards or taking out a personal loan to pay for them is not recommended and can lead to serious debt problems. If you are having to rely on credit cards and loans to pay for holidays and cars then the chances are that you can’t really afford them. Whilst it might seem tempting to stretch yourself financially, it is important to live within your means and if that means going without these luxury purchases then that’s what you should do. It would be a better idea to put money aside each month and save so that you can pay for these items without plunging yourself into debt. Another option is to look for cheaper alternatives; why not find a cheaper holiday closer to home or buy a slightly older version of the car you’ve been considering purchasing. 3.) Remove temptation to spend – when someone has no money in their bank account, you would probably expect them to wait until they next have money available before they make any further purchases, particularly for items that they want rather than need. However, this isn’t always the case as those with credit cards can continue to make purchases despite not having the funds in their account to cover the cost. Whilst this might be a necessity for everyone from time to time, continuously relying on your credit card to pay for things because you don’t have the cash available in your bank account is not a healthy spending habit. 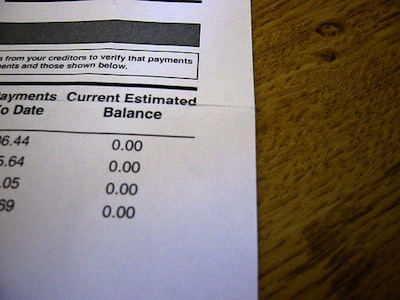 This money has to be repaid at some point and these repayments will eat into your finances for the following month. If you regularly find yourself paying for purchases using your credit card because you don’t have the money in your bank account to cover the cost, there are a couple of things that you should do. The first is to examine your finances and spending habits and look to cut back on your outgoing spend. It’s important to live a lifestyle that reflects your monthly income. If you have money available to spend on luxury items then that’s fine. If you don’t have the money available then you should avoid making these purchases full stop. Using a credit card in this way is irresponsible and will lead to debt. With this in mind, the second recommendation is to consider getting rid of your credit cards. Credit cards can encourage people to spend beyond their means. If you are one of those people then it might be worth considering canceling your credit cards so that you no longer have the temptation and means to spend money that you don’t have. 4.) Manage your debt – it’s not unusual for a person to have some debt and it isn’t necessarily a bad thing as long as the debt is controlled and managed. It’s only when debt is left to spiral out of control that it becomes a major issue in a person’s life. With this in mind, it is vital that you manage any debts that you may have and ensure that you are able to meet all repayments on time. In an ideal world, responsible spending in the first place should ensure that you don’t load yourself with too much debt. Realistically though this isn’t always going to be the case. Anyone in debt should keep track of all of your debts and know how much and when each repayment is due to be made each month. In some cases it is possible to reduce the amount you are repaying by shifting your debts, perhaps from one credit card to another. Many credit cards offer interest free periods so if you are currently paying a fairly high rate of interest on your credit card then it might be worth looking at balance transfer credit cards. 5.) Get the best deal – one way in which it possible to avoid debt is by making the money you do spend go further. If you are looking at making a purchase, it goes without saying that you want to pay the cheapest price possible for that item. Whether it’s on services that you pay for every month like gas and electricity or on one-off purchases like televisions or games consoles, it is important to spend some time comparing prices from a number of different retailers/providers to ensure you get the best deal possible. Prices can vary greatly from one seller to the next which makes shopping around an important part of the buying process. Whilst you might decide that this isn’t necessary for smaller purchases, when it comes to buying more expensive items like televisions and games consoles, the potential savings to be made will surprise many. The same goes for things like gas and electricity, all types of insurance and financial products such as credit cards and loans. Once again prices will vary from one provider to the next so be sure to shop around. The introduction of price comparison sites has speeded up the comparison process with many of these sites comparing prices and products from the majority of the major suppliers. Make use of these sites to collect prices from a range of different sources to ensure you get the best deal possible. Set small goals. Break down the large goal of getting out of debt into smaller goals: pay off credit card X, etc. That way you can start to feel the progress and really feel good about yourself and be encouraged to keep on going. @ Jenna, that’s a good point often people overwhelm themselves, by just taking one step at a time things seem more manageable. I like the idea of assigning a score of one through ten to an item before you buy it in order to decide if you really need the item. This can really help you to avoid impulse buys that you will regret later. As a business owner or manager, it is your job to have a basic understanding of some of the simpler financial management techniques—especially if you want your company to succeed. You need to be able to keep your books and manage your money in an effective manner if you want to sustain and grow your small business. If you are having to rely on credit cards and loans to pay for holidays and cars then the chances are that you can’t really afford them. Whilst it might seem tempting to stretch yourself financially, it is important to live within your means and if that means going without these luxury purchases then that’s what you should do.